A jagged, wooden hill that plays all the places Darwin visits twists and turns in front of a curved screen depicting Cambridge and the English countryside in austere watercolours. These eventually give way to a more vibrant, photo-realistic depiction of places outside dull and dreary Britain: New Zealand, Tenerife, Tierra del Fuego and the Galapagos, amongst many others. They are interspersed with striking animations evoking the wonders of the natural world – a sea specked with bio-luminescent algae, a starry sky, a rainy jungle. The design’s progression more efficiently captures the transformative nature of this journey both within Darwin and the wider fields of science and theology. Dead Puppet Company’s menagerie of creatures are just as remarkable as the projections. Unapologetically skeletal in their construction, their capacity for physical movement charms the audience with their life and expression. Though the puppetry and design paint a spectacular stage picture, the script’s dialogue is stuffy and superficial. There’s no hint of subtext or metaphor, either up a mountain or in the rainforest or on a ship. Darwin’s theories have some gentle moments of conflict with religion, and slavery is briefly touched on. Imperialism is as well, though largely brushed off. There’s so much scope to delve into colonialism and critique it from a contemporary perspective, but it’s utterly ignored. Instead, we are presented with a straightforward, shallow telling of privileged white men conquering and compartmentalising the earth. There is a token man of colour cast as the civilised savage, and a token women who plays Darwin’s love interest and a nearly-silent sailor. Outside of the design, there’s a dearth of imagination in the writing and the casting. If the audience must believe an actor waving a stick about with the outline of a butterfly attached to the end is an actual butterfly, surely they would also accept that a performer of any gender or race is Charles Darwin, and for history to be constructively criticised. 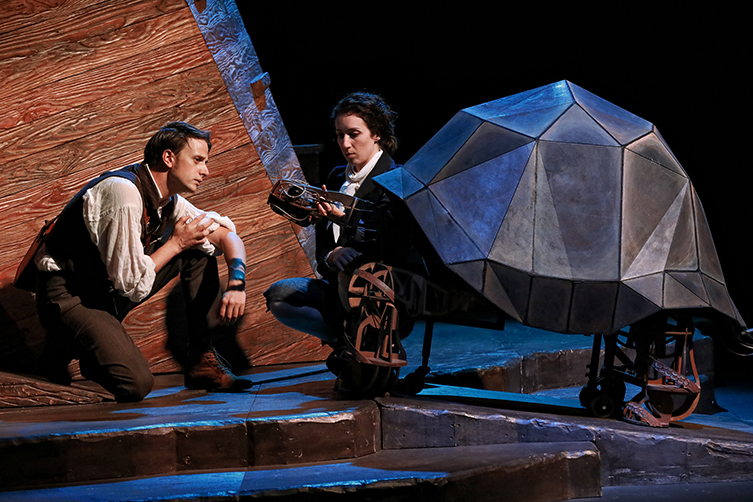 The Wider Earth runs through 30 December.